Lisa, are you up at this early hour? I thought only I did 0500 blogging . Sounds yummy and I am sure that it didn't last long! Reminds me of a pie that my Gran made. Had not thought about that in awhile, thanks for the sweet reminder! My guys would love this! It really looks delicious! I can imagine how long that will last, it looks so good! Great idea for dinner! Looks yummy and just remember my mom used to make these all of the ttime! You reminded me of my Aunt Bernice. She taught 4H cooking classes. Looks so light and fluffy. Yum! It looks delicious! My son would love it! Ohmygosh! Delicious! Thanks for sharing Lisa. I am almost happy my hubby and my hips do not appreciate chocolate BUT we've two friends who are chocolate nuts, this is definitely a recipe for them. Shall I share when I make your recipe? 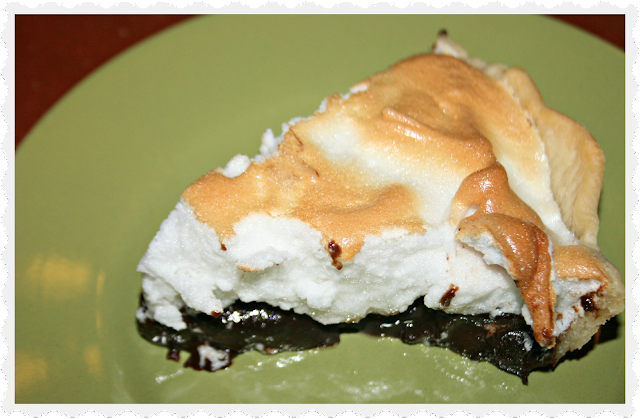 Wow Lisa, this is my absolute fave pies...it looks soooo Yummy! I can't get the recipe now but will come back if you don't mind. Thanks for sharing it! I can see why it didn't last! LOL! Oh my gosh! That brings back so many memories! My mom used to bake that pie when I was a kid! That was one of my favorites! I'll have to try to jog her brain to see if your recipe is the same as what she can remember of how she made it back then. She don't cook anymore like that because of her health. Thanks for sharing! 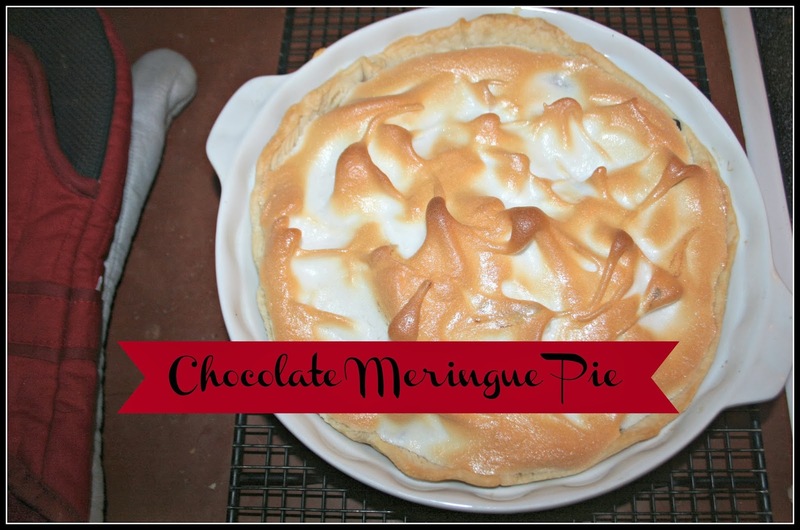 As someone who is accustomed to lemon meringue pie, I was a bit startled by the thought of chocolate meringue pie. But it seemed pretty good by time I got to the end of the recipe. Enjoy! I'd love the bottom part with the chocolate, the upper part I've always disliked, my mother used to make this apple meringue pie, I always passed and got something else. Oh my goodness o that looked so beautiful - I like the tops golden brown! Oh my! And milk-free… I should try this! This looks really good! The meringue topping is absolutely perfect and so pretty. I've actually never made a meringue pie but I want to someday! I am so wanting chocolate right now. Thank you for sharing this recipe.I will be sure to try this asap. wow, you're one amazing mom! I always loved a tested pie recipe! Looking for some new ones for the holidays! I am back in the blogger world! I have missed my blogger friends! Old Kiss the Olive Blog to ...with love. Come visit! oh wow, that looks awesome. This would go over very well in my home. :) yum!